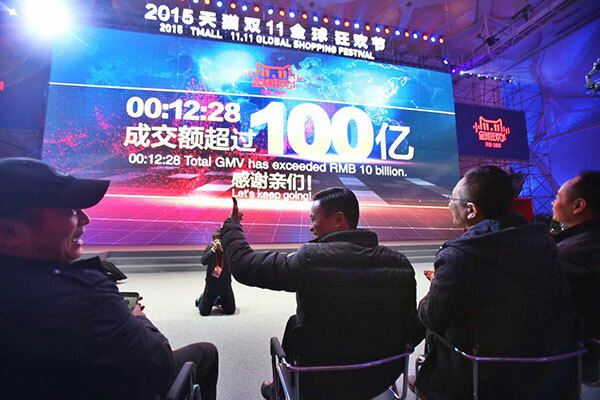 China's e-commerce industry set another jaw-dropping sales record on Singles Day, the world's biggest online shopping event, with Alibaba reporting that about 91.22 billion yuan ($14.33 billion) was spent in 24 hours on Wednesday. The e-commerce giant, which accounts for 8 percent of China's total retail volume, said its sales total on Wednesday far exceeded the 57.1 billion yuan in transactions it generated last year. Suning Commerce Group, an online-to-offline retailing company with headquarters in Nanjing, Jiangsu province, also said its number of orders tripled on Singles Day. The army of Internet shoppers had ordered 37,000 health products from the United States within 11 hours of the start of Singles Day, said Sun Weimin, vice-chairman of Suning. By 6 pm, customers also had ordered 220,000 Xiaomi smartphones, 380,000 boxes of Durex condoms and nearly the same number of mobile power chargers, according to a statement from the Suning group. Jack Ma, executive chairman of Alibaba, said on Wednesday that Singles Day represents only a small part of the huge potential for domestic demand in China. Hundreds of thousands of businesses benefit from Singles Day－not only Internet companies, but also other companies that produce quality products. "China has a middle-class population of 300 million. We believe there will be 500 million within the next 15 years, which would bring huge demand for high-quality products, therefore boosting economic growth," he said. China's retail sales climbed 11 percent year-on-year in October, the fastest gain this year, overcoming a slowing economy. With China's economy entering the phase of a new normal, consumption is seen by China's leaders as an increasingly important powerhouse to drive growth. The frenzied online buying has sent shivers through China's thousands of malls and department stores. On Nov 4, Commerce Ministry spokesman Shen Danyang said retail stores faced increasing pressure from the booming online shopping sector, with some stores closing or canceling their leases. By the end of June, nine major retailers, including Dalian Wanda, Parkson and Marks& Spencer shut down at least 25 stores in Beijing, Shanghai, Guangzhou and other cities, Xinhua News Agency reported on Wednesday. The online shopping festival was initiated by Alibaba in 2009. Alibaba is not the only e-commerce player to successfully stimulate domestic consumption on Singles Day. JD.com, Alibaba's biggest e-commerce rival in China, outperformed its sales record from last year on Wednesday within 12 hours of the online shopping festival's kickoff at the stroke of midnight. By 5 pm on Wednesday, it had received more than 20 million online orders, the company said. About 70 percent of Alibaba's and JD.com's orders were placed via mobile channels, such as smartphones and tablets.